Trump's image on Israeli coin, U.S. embassy → Jerusalem, 58 dead & 2700 injured! "…figure of US President Donald Trump, alongside Cyrus, King of Persia, who made the building of the Second Temple possible"
Learn about what happened in January 363 A.D., where miracles prevented the rebuilding of the temple with the support of Julian the Apostate and caused many Jews to confess the God of the Christians and seek baptism. 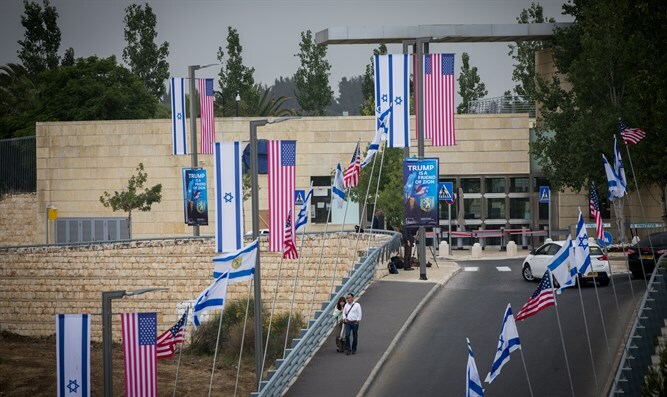 The U.S. moved its embassy from Tel Aviv to Jerusalem on Monday, and now "58 dead and another 2,700 injured"! Re: Trump's image on Israeli coin, U.S. embassy → Jerusalem, 58 dead & 2700 injured! Perhaps they finally found their king. A good portion of the dead were HAMAS jihadists, so let them have at it. Let them have their 75 raisins or whatever it is, although deceased Mohammadans will experience hell like all heretics, unbelievers and Jews. Moslem migration threatens to sink the world into a backward, pagan and primitive inbred future. yes this is more accurate. I forgot to add that Beitar Jerusalem, a soccer team, as added Trump to their official team name. You can read about it here. Perhaps they will try to make him king soon. It was already a bad enough idea and move. Why go through the pomp and circumstance of a dedication? Just to rub some more salt into the wounds? You would think they were dedicating a temple or something that day. Actually, it's very much like that. The Empire has landed in Jerusalem. And along with it its religion of abortion on demand, gay marriage and the upcoming new Crusade of Christians at war with the Mohammedans. The so-called "clash of civilizations". Also, I was under the impression that the move was decided but that it would be years done the road. Like a statement of intention when it was first announced. I was surprised it was done so soon. By the way, what was the cost to taxpayers for this move? I can imagine much spy prevention gear has to be moved and all sorts of other security concerns to install at the new building alone that may run into the hundreds of millions, if not billions. Why did Javanka need to be there for the dedication? Why couldn't they just quietly move it? The entire thing was designed to incite the tragedy that unfolded on Monday. More will come. I was basically done with Trump during the transition phase based on what I was seeing and sensing. But I was completely done with him on Day 77 when he launched the missile strike on Syria over that "most beautiful piece of chocolate cake" the Orange Clown had ever seen which he shared with the Chinese Dictator. There is one good thing that may come out of this. That is hopefully the United States will no longer be the "peace broker" between the Palestinians and the Israelis. Which as far as I am concerned has been the biggest problem in the Palestinian/Israeli peace talks over the decades. All this pro-Counterfeit Israel Zionist nonsense is more "Evangelical Catholic" Pence than Trump. I kind of doubt that. It could be the reason why Trump picked Pence as his vice, but Trump has proven that he is a zionist through and through, especially recently. Then how do you explain Trump signing a.447? 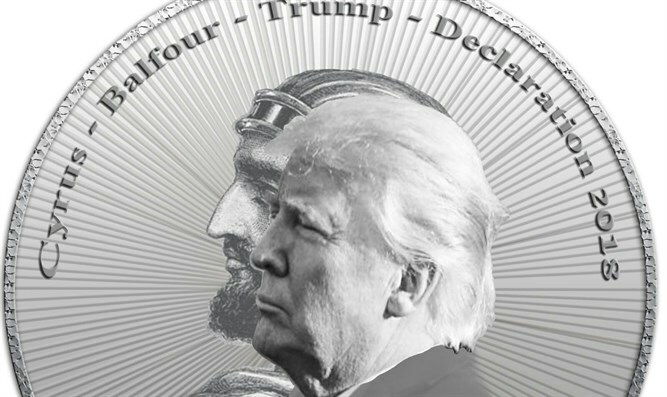 Temple organizations issue half-shekel coin showing Trump alongside Cyrus, King of Persia. 'Cyrus - Balfour - Trump - Declaration 2018. As a crazy Christian zionist Trump is playing his part in bringing about the antichrist. Next step - regime change for Iran which will allow the US to place military bases up against Russia's underbelly. Meanwhile the Palestinans of East Jerusalem, with their impotent rage, will be increasngly harrassed and pushed out of the city. And then the way will be clear for rebuilding the temple. With Iran in chaos and the Russians out of the region, who will stop them?